Sharbat Gula (Pashto: شربت ګله, literally “Flower Sherbet“) (Sharbat is pronounced [ˈʃaɾbat]) (born ca. 1972) is an Afghan woman who was the subject of a famous photograph by journalist Steve McCurry. Gula was living in a refugee camp in Peshawar, Pakistan during the time of the Soviet occupation of Afghanistan when she was photographed. The image brought her recognition when it was featured on the cover of the June 1985 issue of National Geographic Magazine, at a time when she was approximately 12 years old. Gula was known throughout the world simply as the Afghan Girl until she was formally identified in early 2002. Gula, of Pashtun (Pathan) ethnicity, was orphaned during the Soviet Union‘s bombing of Afghanistan and sent to the Nasir Bagh refugee camp in Pakistan in 1984. Her village was attacked by Soviet helicopter gunships sometime in the early 1980s. The Soviet strike killed her parents—forcing her, her siblings and grandmother to hike over the mountains to the Nasir Bagh refugee camp in Pakistan. She married Rahmat Gul in the late 1980s and returned to Afghanistan in 1992. Gula had three daughters: Robina, Zahida, and Alia. A fourth daughter died in infancy. Gula has expressed the hope that her girls will receive the education she was never able to complete. At the Nasir Bagh refugee camp in 1984, Gula’s photograph was taken by National Geographic photographer Steve McCurry on Kodachrome color slide film, with Nikon FM2 camera and Nikkor 105mm F2.5 lens. Gula was one of the students in an informal school within the refugee camp; McCurry, rarely given the opportunity to photograph Afghan women, seized the opportunity and captured her image. 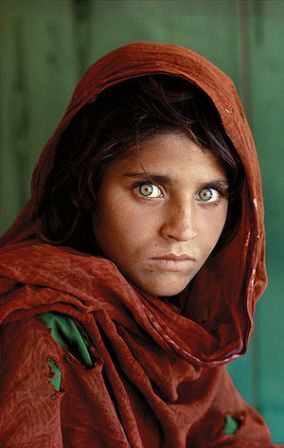 Although her name was not known, her picture, titled “Afghan Girl”, appeared on the June 1985 cover of National Geographic. The image of her face, with a red scarf draped loosely over her head and with her piercing sea-green eyes staring directly into the camera, became a symbol both of the 1980s Afghan conflict and of the refugee situation worldwide. The image itself was named “the most recognized photograph” in the history of the magazine. The identity of the Afghan Girl remained unknown for over 17 years; Afghanistan remained largely closed to Western media until after the removal of the Taliban government by foreign troops and local allies in 2001. Although McCurry made several attempts during the 1990s to locate her, he was unsuccessful. In January 2002, a National Geographic team traveled to Afghanistan to locate the subject of the now-famous photograph. McCurry, upon learning that the Nasir Bagh refugee camp was soon to close, inquired of its remaining residents, one of whom knew Gula’s brother and was able to send word to her hometown. However, there were a number of women who came forward and identified themselves erroneously as the famous Afghan Girl. In addition, after being shown the 1985 photo, a handful of young men falsely claimed Gula as their wife. The team finally located Gula, then around the age of 30, in a remote region of Afghanistan; she had returned to her native country from the refugee camp in 1992. Her identity was confirmed using biometric technology, which matched her iris patterns to those of the photograph with almost full certainty. ^ Lucas, Dean. “Afghan Eyes Girl”. 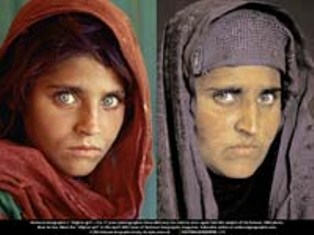 http://www.famouspictures.org/mag/index.php?title=Afghan_Eyes_Girl. Retrieved 2007-04-30. ^ “Nikon World: Summer 1998, Volume 4, Issue 1”. Nikon World. ^ “National Geographic: Afghan Girl, A Life Revealed”. washingtonpost.com. The Washington Post Company. 2001-04-10. http://www.washingtonpost.com/wp-srv/liveonline/02/world/world_mccurry041002.htm. Retrieved 2009-03-31. ^ Braun, David (7 March 2003). “How They Found National Geographic’s ‘Afghan Girl'”. National Geographic Society. http://news.nationalgeographic.co.uk/news/2002/03/0311_020312_sharbat_2.html. Retrieved 31 March 2009. ^ “National Geographic Society: Afghan Girls Fund”. National Geographic Society. Archived from the original on 2004-12-06. http://web.archive.org/web/20041206042103/http://www.nationalgeographic.com/donate/afghan_girls_fund.html. Retrieved 2009-03-15. ^ “National Geographic Society: Afghan Children’s Fund”. National Geographic Society. http://www.nationalgeographic.com/donate/afghan-childrens-fund.html. Retrieved 2009-03-15. “Along Afghanistan’s War-torn Frontier” by Debra Denker, part of the June 1985 National Geographic article.